Despite the long history of medical simulations, suffering from the patient-specific heterogeneous heart physiological structure and complex intravascular procedures, it is still challenging for patient-specific percutaneous coronary intervention (PCI) surgery simulation. In this paper, we advocate a haptics-equiped interactive prototype system towards PCI surgeons training and patient-specific surgery rehearsing, which can afford trainees the opportunity to approximately experience the entire PCI procedures and customized emergency cases that might occur in common clinical settings. 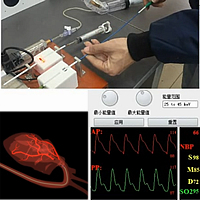 The full simulation covers tissue deformation, catheter and wire simulation, X-ray simulation, haptic feedback, and 3D realistic rendering, which in all give rise to the integrated physical, visual, haptic, and procedural realism. Our system can accommodate various comprehensive operations involved in PCI-related procedures, including feeding wires, releasing stents, injecting contrast medium, simulating X-ray, bleeding, etc. Moreover, our system framework is fully built upon CUDA, and thus can achieve real-time performance even on a common desktop. The high-fidelity, real-time efficiency and stableness of our system show great potentials for its practical applications in clinical training fields.